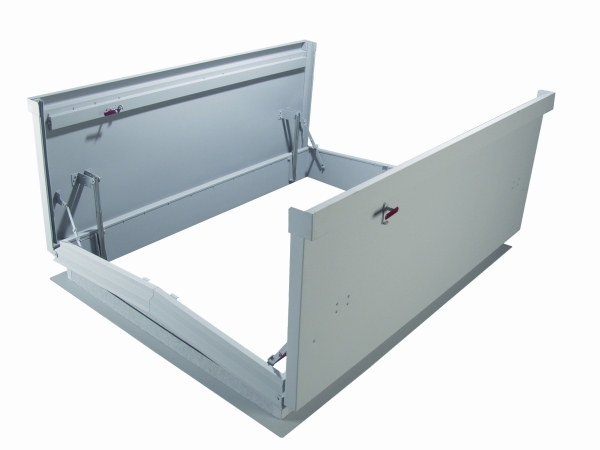 Both the galvanized and aluminum equipment hatch include a 12" high curb and 4" wide flange for securing to roof deck. Insulation: The lid has 1” fiberglass insulation in the space between the exterior cover and liner. See below for polyisocyanurate insulation option. Construction: Hatch is 14 gauge galvanized steel (EHG) or .090 aluminum (EHA) fully welded and ground smooth for weather tightness. Includes 12” high curb and 4” wide flange for securing to roof deck. The cover includes a 14 gauge galvanized steel or .090 aluminum exterior and metal liner with a continuous bulb-neoprene door seal. Oversize doors may be spliced. Hardware: Hardware includes heavy-duty galvanized hinges, pressure intensifiers, hold-open and operating arms with red vinyl handlegrip. Torsion springs are provided for oversized hatches. Lid hardware has a 2 point universal spring latch, and exterior and interior handles with integral padlock. Finish: 2 coats prime coat. Join now for email updates from Activar Construction Products Group. Copyright 2019 Activar Construction Products Group, Inc.